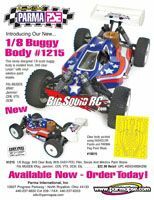 New Parma 1/8th Scale Buggy Body #1215 « Big Squid RC – RC Car and Truck News, Reviews, Videos, and More! New from Parma is this newly designed 1/8th scale Buggy Body #1215. It’s made from thick .040 clear Lexan and fits Mugen, Xray, Jammin, CEN, VTX and OCM, and probably a few others. It’s a good price, only about $22. Click the picture for details, or head over to the Parma site.